Today's photo art was created in Photoshop Elements using the Brush Stroke effect Dark Strokes. Love how it frames my eyes and enhances my tabby markings! Check out my Zazzle store for more cat art goodies! Athena! This technique makes yous looks like Cleopatra! Qhat a great picture! We love how it frames your eyes. Athena it certainly does enhance your beauty! Happy Caturday!! You always have beautiful art, but this is one of my favorites. I love your tabby markings. That's a great effect. We need to do more with Photoshop. Another beautiful image of you, Athena! No matter what effect is used, you look gorgeous. I also love how the background color really makes this one pop. Thank you for hosting this fantastic blog hop each week! Gorgeous! Don't remember that filter in my PS but will have to look now. 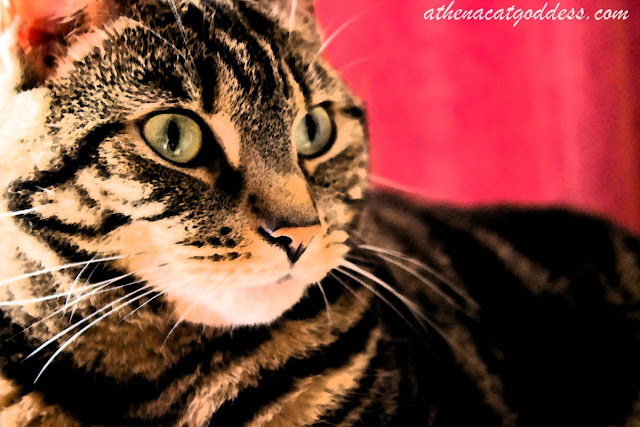 That effect is lovely on you, and your tabby markings are beautiful. You are looking gorgeous as usual sweetie. Great art work again. I love all the art I've been seeing on this fine Caturday! My name is Robin Whiskers, and I'm a 13 year old pet sitter, dog walker, and show dog handler who shares a blog with Christmas the 2 year old mini Dachshund. We post every day, and Chris is even running for mayor of Blogville! I hope you can stop by our blog (www.pawprovince.com) and follow us with Google!